(CNN) -- Artillery shells slammed into a hospital Sunday in the northern Sri Lankan district of Mullaittivu, where civilians -- including a growing number of children -- are being treated as government forces and Tamil rebels continue to clash. 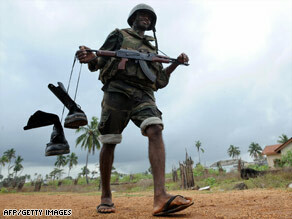 A Sri Lankan soldier walks through Mullaittivu, the former military headquarters of the Tamil rebels. More than 200 civilians and at least 30 children have been injured in the last three days of fighting, a relief worker told CNN Sunday. "That is the absolute minimum (number of injured)," the aid worker, who did not want to be identified for fear of jeopardizing the work of relief organizations, said. Government officials are accusing aid organizations and foreign media of sensationalizing civilian casualties. "It looks as if it's convenient for certain agencies to exaggerate the numbers so that this can be converted to a humanitarian crisis in the public eye, " Secretary of Foreign Affairs Dr. Palitha Kohona told CNN. A "handful" of United Nations staff are working around the clock to save a growing number of children caught in the crossfire, a U.N. spokesman said Saturday. Children as young as 4 months old were being treated in local hospitals for shrapnel injuries and other "wounds of war," spokesman James Elder told CNN. "There is just intense fighting in a small area where children and other civilians are," Elder said. "The space (where conflict is taking place) is shrinking and the fighting is augmenting." Thursday, U.N. aid workers rescued 50 critically injured children and 105 adults, he said. "We are trying to get as many people out of there as we can," Elder said. Humanitarian groups say as many as 250,000 unprotected civilians are trapped in the area. Sri Lankan President Mahinda Rajapaksa has promised to allow safe passage to trapped civilians and urged the Tamil Tigers to promise the same. "We have declared a safe zone for civilians, the coordinates of which were announced by the security forces," Rajapaksa said on his government's Web site. "It is unfortunate that the (Tamil Tiger group) is exploiting this declared safe zone for civilians by placing their heavy artillery within the safe zone and using it as a launching pad to attack security forces and indiscriminately kill civilians." The fighting has created a "nightmarish" situation for civilians in the conflict zone, Elder said. An emerging shortage of humanitarian supplies and diminished access to clean water, sanitation, and food are compounding a crisis, he said. Sunday, Sri Lankan soldiers seized a key rebel stronghold in a surprise attack deep in Tamil held territory. Troops crossed a lagoon and entered the town of Mullaittivu before encountering heavy resistance from Tamil fighters, according to the government-run news agency. The The Liberation Tigers of Tamil Eelam (LTTE) -- commonly known as the Tamil Tigers -- have fought for an independent homeland for the country's ethnic Tamil minority since 1983. The civil war has left more than 70,000 people dead.